Using a cooking spray on the pan before frying an egg will help prevent the egg from sticking to the pan. When you plant a seed in the spring, it will stand a better chance of growing if you apply water. A piano teacher will show a student finger exercises and scales to repeat on a daily basis to strengthen fingers for more advanced musicianship. Sharpening a knife will enable the knife to make a cleaner cut. If you are sailing a small sailboat and it tips over, stand on the keel to right the boat. Putting sunscreen on before you go out on a hot summer day will help prevent sunburn. When washing clothes, adding soap to the water will help ensure better cleanliness. Practicing on the guitar daily will help your fingertips develop calluses which facilitates easier and more comfortable playing. After you dye your hair, it is a good idea to wash and rinse it to prevent the dye from ruining your clothes or irritating your scalp. Terrycloth bath towels will dry better outside if you hang them on a clothesline or spread them out flat. The same towels will probably not dry quickly or evenly if you leave them bunched up in a ball. If you haven’t ridden your bicycle in several years, it is a good idea to check the tires for pressure before hopping on. If you plan to surf the Internet, it is a good idea to turn your computer, tablet or iPad on. Did some of these seem silly? You’re probably shaking your head YES… some of these probably seemed quite dumb. But they are all good points and DO make sense. It surprises me when brand new quilters ask a question online (normally on Facebook) about things they sincerely do NOT know about, and when they are given good, accurate and time-tested responses to their questions, they poo-poo the response and say they’re not going to do that. Question #1: I’m a new quilter. Is it necessary that I prewash my fabric before I sew it into a quilt? Answer: Yes, absolutely! Prewashing your fabric is the SMART thing to do, because it releases any extra dye that is in the fabric, thus preventing it from bleeding onto lighter fabrics… AND if you are going to hand quilt, prewashing your fabric will make the hand quilting process go smoother, as the fabric will be softer to the touch. Question #2: I was told that I should baste the layers together before I hand quilt. I’m planning on using pearle cotton because it is stiffer and stronger. Do you agree? Answer: No. Pearle cotton may be stronger, but it also requires a larger needle, and during the basting process can create holes in your fabric that you might not want there. Question#2 Responder: I think I will use the Pearle cotton. I want the thread to be stronger in case I don’t finish the quilting for several years. It will hold it together better. (It might, but it also might give you more permanent holes in the fabric. If you are okay with that, then go right ahead and do whatever you wish. Question #3: Do I have to use a hoop to hand quilt? It seems so awkward. Answer: You will get the nicest look on your quilt if you have a hoop or frame holding the layers in place while you stitch. Holding the layers in place keeps everything consistent. It prevents the layers from shifting. It allows your two hands to work together to develop that beautiful quilting stitch that everyone longs for. It helps prevent puckering. Yes, it will take you a little time to get used to it, and YES, at first you might be frustrated, but if you stick with it, you will soon wonder how anybody can quilt without a hoop or frame. Question#3 Responder: I don’t think I need a hoop. I know lots of quilters who don’t use a hoop and they get by just fine. NOTE TO Responders: Look in old quilt books for photos of groups of women and men quilting together on a frame. Why do you think they do that? How do you think they learned how to quilt on a frame? Through PRACTICE. They know a frame or hoop holds the quilt sandwich together. They learned how to quilt like that from their mother, grandmother or aunt, who learned from THEIR mother, grandmother or aunt, who learned from THEIR mother, grandmother or aunt who learned from THEIR mother, grandmother or aunt who learned from THEIR mother, grandmother or aunt, and on and on and on. Please note that the quilting questions and answers above are intended to provide you with examples. They do not indicate any input by the so-called “Quilt Police,” who actually do not exist. The questions and responses are there to cause you to think. If you have questions about how to do something when hand quilting, take the time to find someone who has hand quilted for ages. Sit by their side, show them what you are doing, and ask for help. Nobody knows everything. Even me. (Especially me!) NOTE: many quilt stores do not have hand quilting instructors. If you can’t find someone to teach you, go online and do a search of quilting videos, well-known hand quilters, or places where you can take a good hand quilting class. 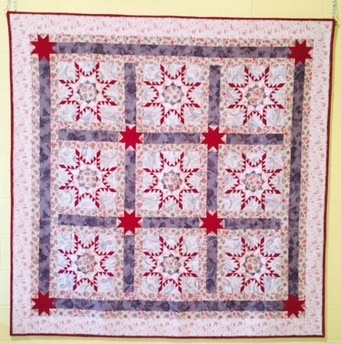 If you are looking for a hand quilting instructor, please contact me – Caron Mosey. I’ll see what I can do to find you a good instructor in your area. If you want to learn how to hand quilt and you live in Michigan, I can help you!! !